Give your health a winning edge by going green with matcha tea. Considered one of mother nature’s most powerful superfoods, matcha brings to life a powerhouse beverage full of valuable antioxidants, vitamins and minerals that fight off free radicals, fortify the immune system and boost energy. Derived from green tea leaves that are specially grown and finely ground into a powder, this age-old tea has been enjoyed and celebrated for centuries, as it’s highly revered for its healthful benefits – supporting a strong body, inside, out. The greener the better! 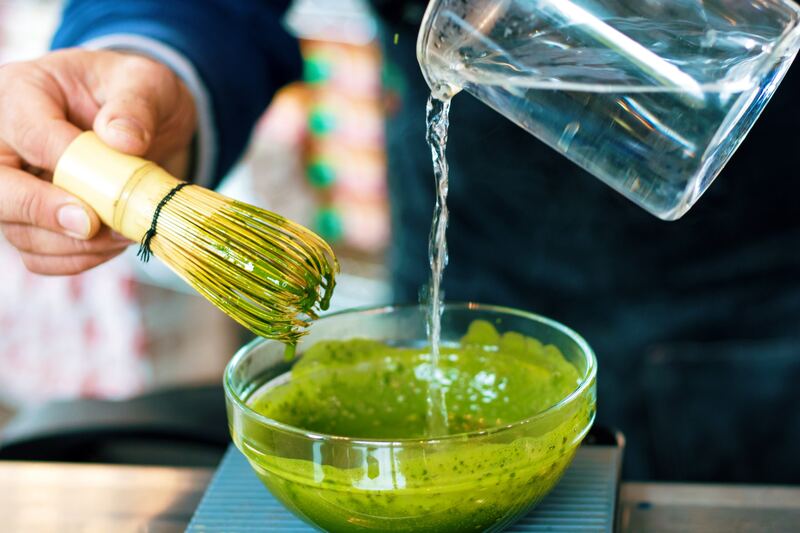 Due to its special growing process, the high levels of chlorophyll found in matcha is what you can thank for its glorious, vibrant colour, as well as being known as a natural detoxifier. With its powerful cleansing properties, it helps to eliminate heavy metals and chemicals from the body, safely purging harmful substances that could otherwise cause havoc to your system. Consuming this green goodness as your go-to beverage, will assist to remedy your intestinal issues and promote a healthy gut environment. Give free radicals a knockout punch with matcha’s antioxidant power. This natural substance may help to neutralize and ward off harmful toxins that invade our bodies, so it’s important to drink and eat foods packed with this essential compound. The more you have the better equipped your body will be at combatting chronic diseases, aging and other ailments. Extracting all the valuable nutrients that comes from grinding up the whole leaf, yields a powerful arsenal of minerals, vitamins, amino acids and antioxidants. One cup of matcha has as many antioxidants as 10 brewed cups of green tea and 20 times more than blueberries or pomegranates! Get a little help shedding those unwanted pounds with EGCG (Epigallocatechin gallate), a potent antioxidant found in matcha. Consuming this wondrous tea as part of your diet, may provide metabolic health benefits as it can boost your metabolism thereby increasing the rate at which fat is burned, and likewise, decrease the formation of new fat cells. So, if your focus is on dropping some pounds, swapping out your java for a cup for matcha, will get you on the road to achieving your weight loss goals. The bountiful nutrients in your new, favourite beverage promotes concentration and clarity of mind without the nervous, jittery energy associated with coffee. Although matcha contains caffeine, it’s the amino acid L-Theanine in this mighty green powder, that helps to create a state of calm alertness. With a combination of this and its other natural properties, drinkers are found to experience a boost of energy throughout the day, without the crash. Declare victory over your health by including matcha tea into your everyday regimen. Hailed as being an immune booster, energy stimulator, digestive supporter and weight loss promoter, it’s no wonder its considered one of the healthiest beverages on the planet. Now, raise up your mugs and cheers to that! You can also enjoy a great sweet potato and shrimp pancake to boost your energy! Check the recipe out here.